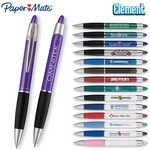 Promotional Paper Mate Element Pen, Item #ELEMENT decorated with your company logo with no setup fees. The Promotional Paper Mate Element Pen is customized for your advertising needs. 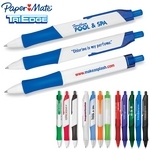 Promotional Paper Mate TriEdge Pen, Item #TRIEDGE decorated with your company logo with no setup fees. The Promotional Paper Mate TriEdge Pen is customized for your advertising needs. Promotional Paper Mate Sport Retractable White Pen, Item #SRTW decorated with your company logo with no setup fees. 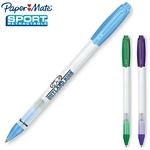 The Promotional Paper Mate Sport Retractable White Pen is customized for your advertising needs. 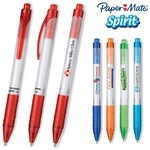 Promotional Paper Mate Spirit Gel Ink Pen, Item #SFWG decorated with your company logo with no setup fees. 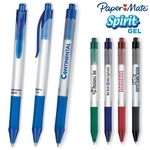 The Promotional Paper Mate Spirit Gel Ink Pen is customized for your advertising needs. 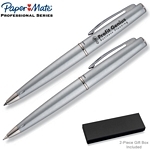 Promotional Paper Mate Sport Retractable Silver Pen, Item #SRTS decorated with your company logo with no setup fees. 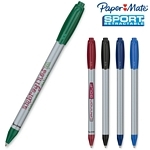 The Promotional Paper Mate Sport Retractable Silver Pen is customized for your advertising needs. Promotional Paper Mate Sport Retractable Translucent Pen, Item #SRTT decorated with your company logo with no setup fees. The Promotional Paper Mate Sport Retractable Translucent Pen is customized for your advertising needs. 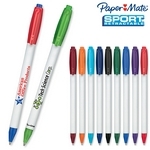 Promotional Paper Mate Sport Retractable Frosted Pen, Item #SRTF decorated with your company logo with no setup fees. 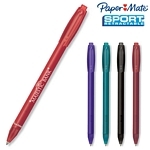 The Promotional Paper Mate Sport Retractable Frosted Pen is customized for your advertising needs. 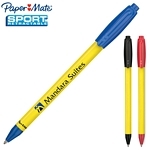 Promotional Paper Mate Sport Retractable Yellow Pen, Item #SRTY decorated with your company logo with no setup fees. The Promotional Paper Mate Sport Retractable Yellow Pen is customized for your advertising needs. 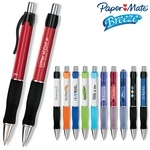 Promotional Paper Mate Breeze Pen, Item #BREEZE decorated with your company logo with no setup fees. The Promotional Paper Mate Breeze Pen is customized for your advertising needs. 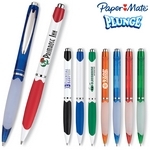 Promotional Paper Mate Plunge Pen, Item #PLUNGE decorated with your company logo with no setup fees. 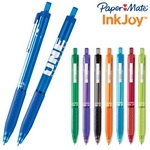 The Promotional Paper Mate Plunge Pen is customized for your advertising needs. 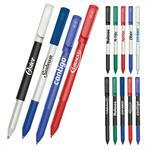 Promotional Paper Mate Propel Pen, Item #PRTB decorated with your company logo with no setup fees. 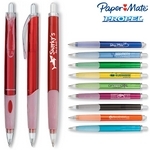 The Promotional Paper Mate Propel Pen is customized for your advertising needs. Promotional Paper Mate Chill Pen, Item #CHILL decorated with your company logo with no setup fees. 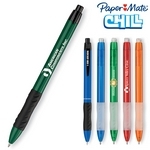 The Promotional Paper Mate Chill Pen is customized for your advertising needs. 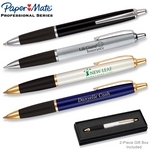 Promotional Paper Mate Lexicon Pen & Pencil Set, Item #50105 decorated with your company logo with no setup fees. 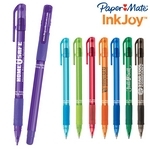 The Promotional Paper Mate Lexicon Pen & Pencil Set is customized for your advertising needs. Promotional Paper Mate Destination Pen, Item #DESTINATION decorated with your company logo with no setup fees. The Promotional Paper Mate Destination Pen is customized for your advertising needs. 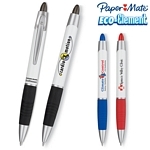 Promotional Paper Mate Eco-Element Pen, Item #EEWB decorated with your company logo with no setup fees. The Promotional Paper Mate Eco-Element Pen is customized for your advertising needs. Promotional Paper Mate Spirit Ball Point Pen, Item #SFWB decorated with your company logo with no setup fees. The Promotional Paper Mate Spirit Ball Point Pen is customized for your advertising needs. 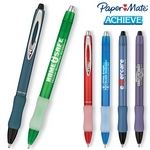 Promotional Paper Mate Achieve Pen, Item #ACHIEVE decorated with your company logo with no setup fees. The Promotional Paper Mate Achieve Pen is customized for your advertising needs.